1-3 business days for sizes 1-7. Sizes 8-10 and customized 2-3 weeks. 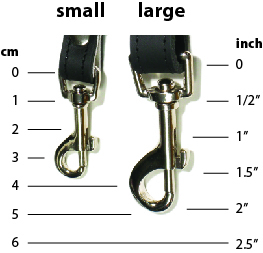 -- Please Choose an Option --	No Lead Leather/Nylon 4'x1/2" Leather/Nylon 6'x1/2" Leather/Nylon 4'x3/4" Leather/Nylon 6'x3/4" All Leather 4'x1/2" All Leather 4'x3/4" Traffic Leash 1'x3/4"
Buddy Belt's unique, patented design reduces stress on your pet’s neck, is easy to use, and made with 100% leather and quality hardware. This luxurious harness has a orange color that is absolutely stunning. Add crystals for more bling! The functional design of the Buddy Belt harness lets your dog step in easily and fastens with one buckle. The stylish harness has a unique, low-cut patented design ensuring pressure is minimized on your dog’s neck and spine. Attach both the leash and ID tags to the sliding o-ring. The o-ring slides to accommodate leash mobility while the Buddy Belt stays snugly in place. The harness should fit snug against the body. Prior to breaking in your new harness, do not keep the harness on for long periods of time. Dogs with senstive underarm skin should get the Buddy Belt suede liners and/or reduce wear time until it is fully broken in. A Funnyfur.com exclusive! Customized Buddy Belt dog harnesses and leashes definitely stand out and add more style. Customization is done by the manufacturer Buddy Belts in Canada and typically take 1-2 weeks to ship. CRYSTALLIZED Buddy Belts are adorned with genuine Swarovski crystals in between buckle holes and large crystal in center. Click on the image above to view image gallery with the Buddy Belt leather color with crystals. TEXAS STAR Buddy Belts are adorned with a large Texas star concho in the center (now with regular rivets, not star rivets). Click on the image above to view image gallery with the Buddy Belt leather color with Texas star concho. CRYSTALLIZED Leads are adorned with 6 genuine Swarovski crystals, 3 on each side of the handle. Buddy Belt harnesses are made of leather. Before initial wear, it is highly recommended that you treat your Buddy Belt with a quality water and stain repellent product. We offer stain guard service with Vectra 16 Protectant for $3-5 which repels tough stains while keeping the suede and leather soft and luxurious looking. Regular stain repellent treatment is recommended to keep your Buddy Belt looking its best. If your Buddy Belt gets wet, allow it to dry flat at room temperature. Never put leather in the dryer. For suede Buddy Belts, buff with a soft towel to restore the surface. Try to avoid products with silicone and/or wax as these ingredients tend to break down the natural oils in leather. Apply product initially and every two to three months with regular wear. Please note that the Buddy Belt dog harness is not intended for swimming or other full water play. To clean your Buddy Belt, gently blot liquid stains with a damp cloth. In the event of salt stains from winter wear, wipe with a clean, damp cloth after each wear and dry naturally. Re-treat as necessary. Our stain guard treatment is non-refundable. Click the button below to add the Buddy Belt Dog Harness - Sunset to your wish list.